It seems like just yesterday the Document Foundation published the speedy new version 3.5.4 of its popular LibreOffice productivity suite, but already there's a new beta version of the next major iteration of the software available for testing. 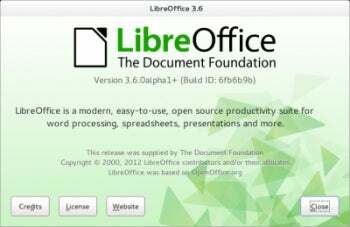 LibreOffice 3.6.0 Beta 1, which was released last weekend, is apparently nearly feature complete, according to the official announcement, and it adds a raft of new features and bug fixes that promise to make the open source software better than ever for users. Two more beta versions and three release candidates are still expected before LibreOffice 3.6.0 makes its final debut, which is scheduled for late July or early August. In the meantime, you can download this first beta release for Windows, Linux, or Mac from the LibreOffice site. Ready for a look at what's coming? Here's a quick rundown of some of the highlights. A number of tweaks have been made to LibreOffice's interface in version 3.6.0, including a new About dialog (shown below), split color buttons for Writer and Calc, more lightweight rulers, and better rendering of GTK themes. The new About dialog in LibreOffice 3.6.0. Also notable about LibreOffice 3.6.0 is that it features performance improvements in numerous areas. Among them are document import, large autocorrect lists, and faster refreshes of pivot tables in Calc. LibreOffice's Writer word processing module has been greatly enriched in version 3.6.0 as well, with features including support for contextual spacing, better .docx import, a word count option in the status bar, support for importing Smart Art, and a refined label/business card wizard. Among many improvements in LibreOffice's Calc spreadsheet module are a new option for specifying a custom sheet name prefix in new documents and improved .csv file import and export. Marked cells can now be merged via the right mouse click context menu, and several new spreadsheet functions defined in ODF OpenFormula have been added. Perhaps most notable among the changes to LibreOffice's Impress presentation module is a new widescreen format, while the Math formula editor has gained new Help buttons. A new import filter in LibreOffice 3.6.0 targets Corel Draw documents, while PDF export now offers a watermark option. ODF Export, meanwhile, now comes with a new compatibility mode for wider interoperability. Last but not least, the list of bugs fixed since the release of LibreOffice 3.5.4 is already too long to count, and work still continues.